It’s not just about burning calories, the real goal should be about getting more fit and healthy (but this usually means burning more calories), which also means losing weight– a struggle for most people! It is your lifestyle, after all, that has the biggest impact on your overall health, fitness and weight. Unfortunately, a lot of us sit at a desk half of the day, and on top of that, are also sitting many hours a day in the car and on the couch. That’s a lot sitting! But, burning the extra calories to make up for our inactive lives doesn’t necessarily mean we have to join a gym or wake up hours before sunrise to be more active (although, it doesn’t hurt if you have the time for this!). 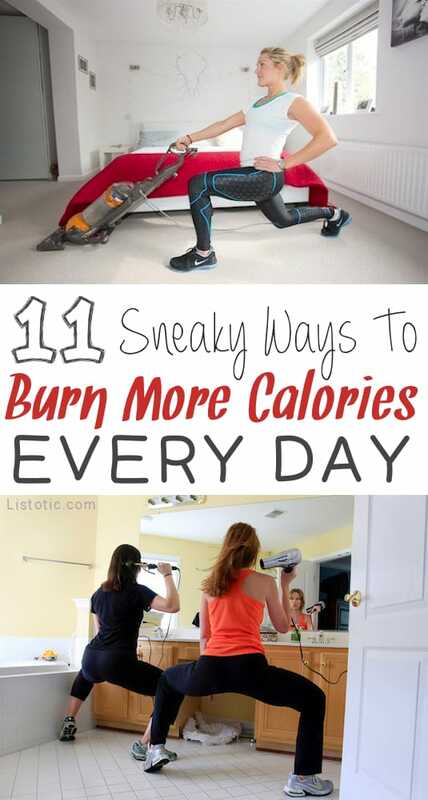 Here are a few easy ways to burn extra calories every day by making small changes to your daily routines. If you were to count up all the free minutes you have during the day in between chores, while cooking dinner, or standing in line, you might just find that you actually have more free time to workout than you’d think! Instead of waiting for the water to boil, the toast to be done, or the dryer to beep, do counter pushups, squats, lunges, calf raises, or any thing else that is active in place of standing around while you wait (even kegels while you stand in line at the grocery store). 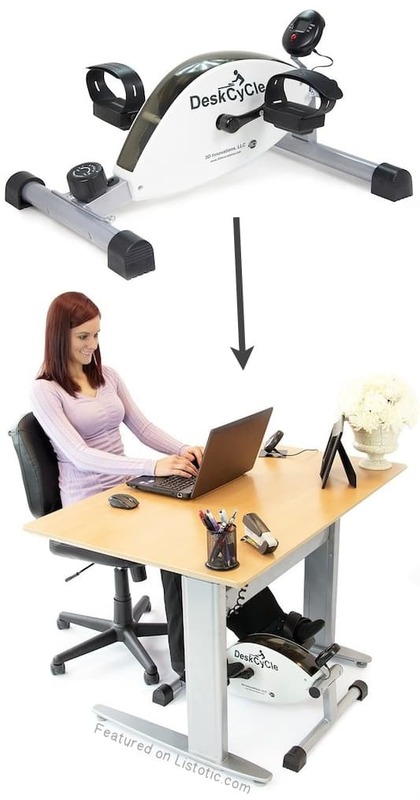 Can you think of a better way to get moving while you sit at your desk?! I just bought one of these DeskCycles a few months back, and to be honest, it’s kind of hard to cycle when you’re really trying to concentrate or type, but I love to sit back every 5 minutes or so and pedal until I get my heart rate up a little. It even comes with a display you can put on your desk that tells you your speed, time, distance, and calories burned. I can usually get an extra 100-200 calories burned at my desk depending on how long my work day is. I think it’s in our nature to do things the fastest and easiest way possible, but if you can purposely make your life just a bit more physically challenging, you can burn an extra 100+ calories a day just by making small changes to your routine. 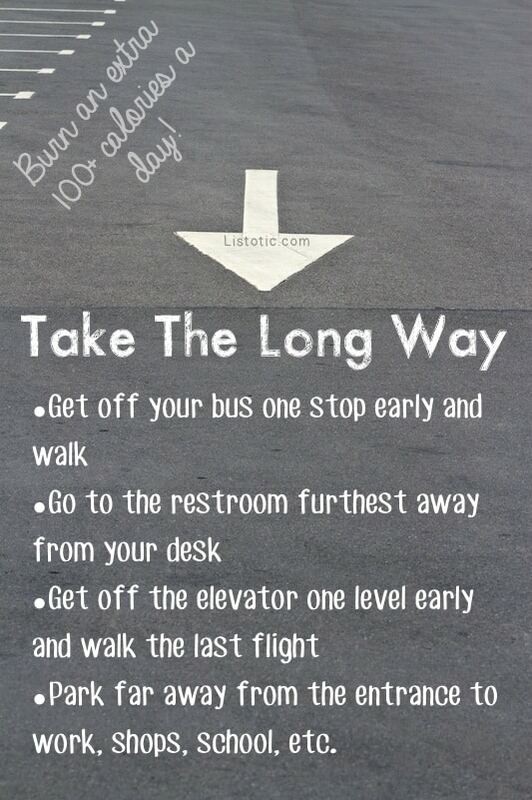 You have probably already been told to park far away when out shopping to get those extra steps in every day, but what about getting off of the elevator a level or two early and walking the rest of the way, using the restroom that’s the furthest from your desk, or getting off the bus or subway one stop early? Time might not always permit this, but taking the long way isn’t always the wrong way when it comes to burning a few extra calories.